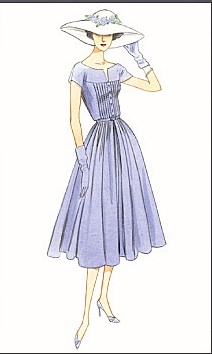 I love the little pointy collar, the front skirt seams just scream "pocketize me!" and those gathers at the shoulder just make me swoon. I should add "shoulder gathers" that to the list of my "triggers"—isn't it true that once you're aware of your triggers, you can change them (if you want to)? My trigger list would probably read "penny loafers, robots, sarcasm, Peter Pan collars, synthesized handclaps, Adidas Gazelles (on guys), books that smell like old books, red lipsticks (which I never wear) …" Actually, looking over that list, I don't think I want to change any of those triggers. (Except maybe to start wearing the damn lipstick.) Oh, well. Before I forget I should let y'all know that Janet at Lanetz Living is going to Mexico. Why should you care that Janet is going to Mexico? Because she's using it as an excuse to have a sale! You can take 25% off on all orders from now until she comes home next Tuesday. The sale will end at Midnight (CST) on 5/6/08. Use the coupon discount code "Mexico25". It needs to be entered on the shipping page as one word. (If you try to put a space between Mexico and 25 it will not work.) And, as always, Janet offers free shipping with 3 or more patterns … and patterns will continue to ship out while Janet's on the beach. Oh — I really like the idea of Sept. 1 being "wear a dress day," as proposed in the comments on yesterday's post. Let's start working on the logistics, people! The main point of the article seemed to be that those in the fashion industry are tired of dresses, and are looking towards pushing "the pant" for fall. Yes, even though the article touts dresses as "glamorous", "easy", "slimming", "efficient", "flattering", and "attractive", (not to mention the obligatory nod to the patriarchy with "guys like [them]") their time is UP. Which gives me, what, 124 days, more or less? Is "PantADay.com" already taken? 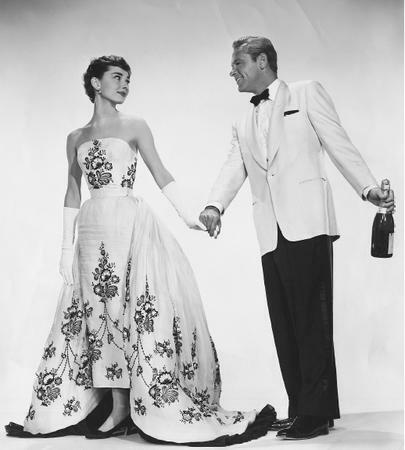 No, no, no, don't worry — I've made it this far without taking the pronouncements of the fashion editors seriously, and I think I can struggle through an autumn where "the full-legged, pleated high- and low-waisted legions will be out in the urban jungle" (as Ms. Slowey put it). 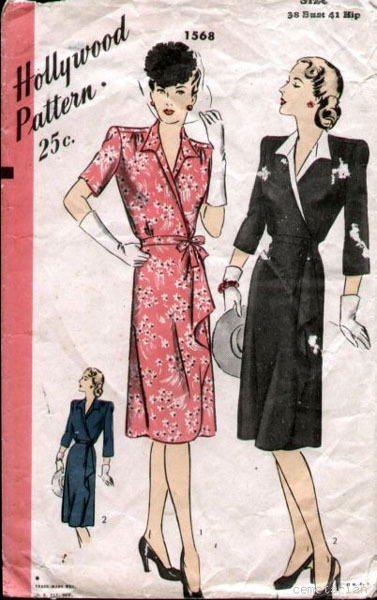 But if, like me, you are going to continue wearing dresses past 31 August, there are some strategies for getting through this difficult time of dress shortages and rationing. The most obvious work-around is to learn to sew, so that you simply don't care what's in the stores (aside from the fabric stores). If you don't think you can swing that by the end of August, you should start looking to buy vintage. Don't wait until October when the shortages will be most acute; start searching now — especially if you're an odd size. If you are shopping for velvet in July you won't have many competing bidders, and you can ward off the tragedy of having to wear pants to all your holiday parties. Don't forget the downturn in accessories availability that accompanies a dress shortage, as well: tights may be in short supply, along with slips of all kinds and full-skirted coats. It's a little trickier to predict what will happen with shoes, but if you want taller boots, they tend to be harder to find in an environment where dresses are scarce. With some careful planning you should be able to continue dress-wearing activities well past the expiration date forecast by Ms. Slowey and her ilk. And, while they're waiting in line at the tailor to get things taken in and let out and taken up and let down (pants are notoriously NOT one-size-fits-all), you can swan by in your easy, nicely-fitting dress. Don't forget to thumb your nose as you pass. 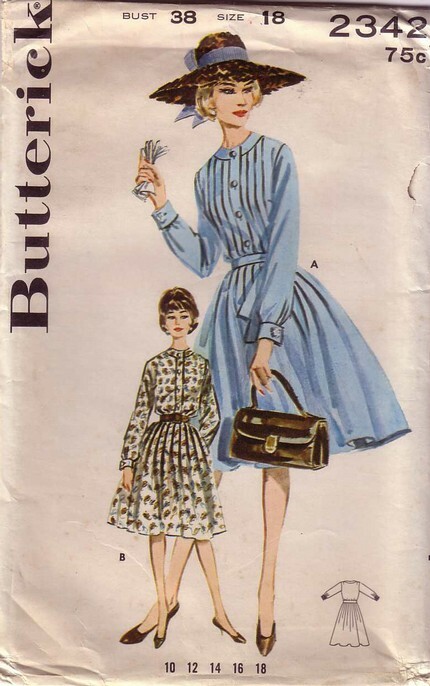 This was a two-alphabet-dress trip for me; I wore the blue letter-and-number print dress the next day. Eventually I suppose I'll have made enough alphabet-print dresses that I can wear nothing but fonts for a week straight, and will have completed my descent into caricature. 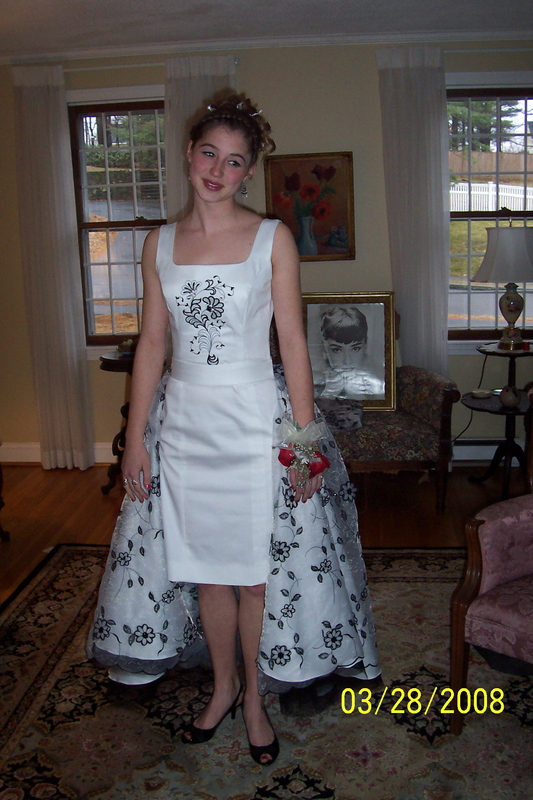 Last week I got this wonderful email from Clarissa, who wanted to tell me about her first major project: her junior prom dress. And she was so smart to turn it into a sheath with straps; I wore a strapless dress to a prom once and spent the whole night tugging it UPWARDS. Not what you want to be doing at prom! In short, well done! I'm especially impressed by any young lady who chooses to look so elegant, when there are so many options to look … not-elegant. Also: those are really cute shoes. This one, from Miss Helene's, is really cute. I love the faux-western yoke. But I am NOT BUYING IT. 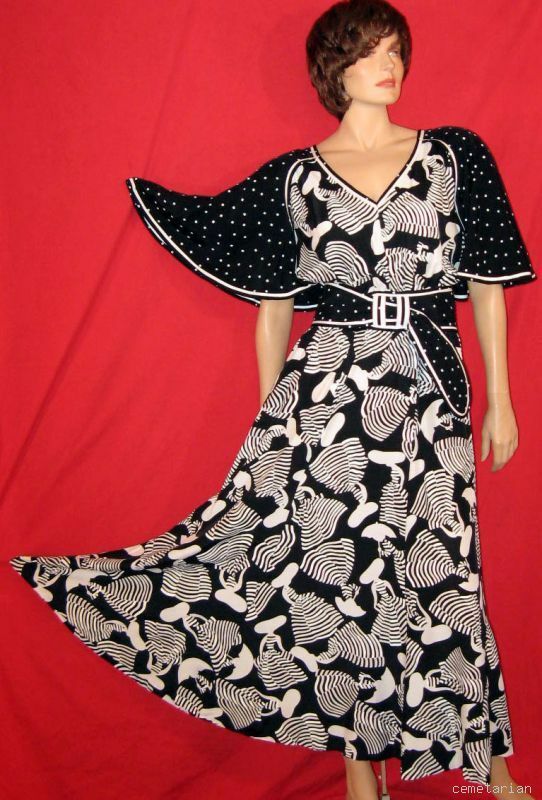 Sent by Deb, and available from BootyVintage, is really elegant and sophisticated. (Probably too elegant and sophisticated for me, as those of you who know me will attest.) So it's available to YOU! 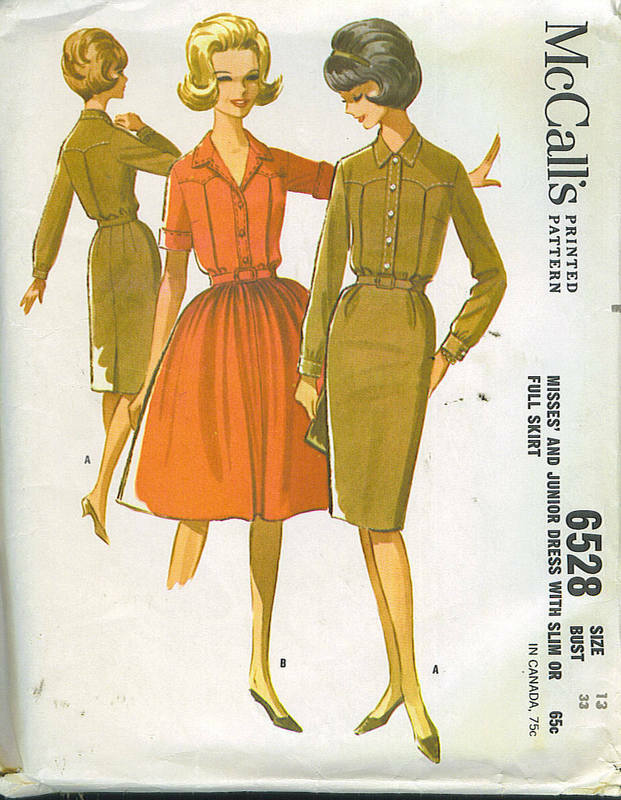 Just the thing for when you can't decide between a wrap dress and a shirtdress. So, see? I haven't bought the ALL. There's plenty left for you guys! I get a lot of email now from people who are new to sewing, and who want (for some reason) my advice. Just last week I got a very kind email from Elizabeth, who wanted me to help her choose between two patterns. 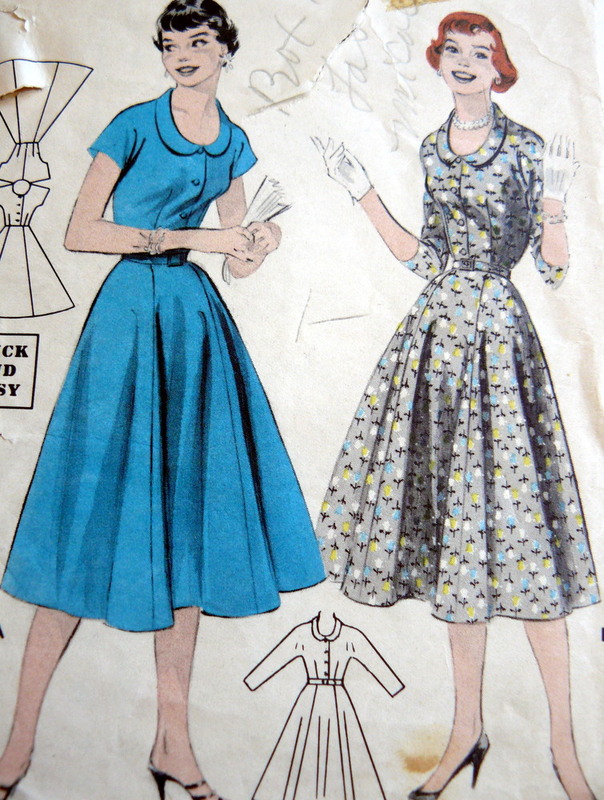 Now, usually, my advice is just to buy both, to avoid regret, but I went and looked at her pattern choices. Her choice B was unremarkable (and a little difficult for a first project) but her choice A … I fell in love. If her choice A had been in a romantic comedy, I would have been in the role of matchmaker, and this would have been the perfect guy … who then asked to be set up with my best friend. Hijinks would ensue. Now, giving advice to newbies is a sacred trust, and even though the dress was up for auction on eBay, I couldn't go and snipe it! That wouldn't be sporting! So I appeal to you all — does anyone have a copy of this for sale? B36, by preference? 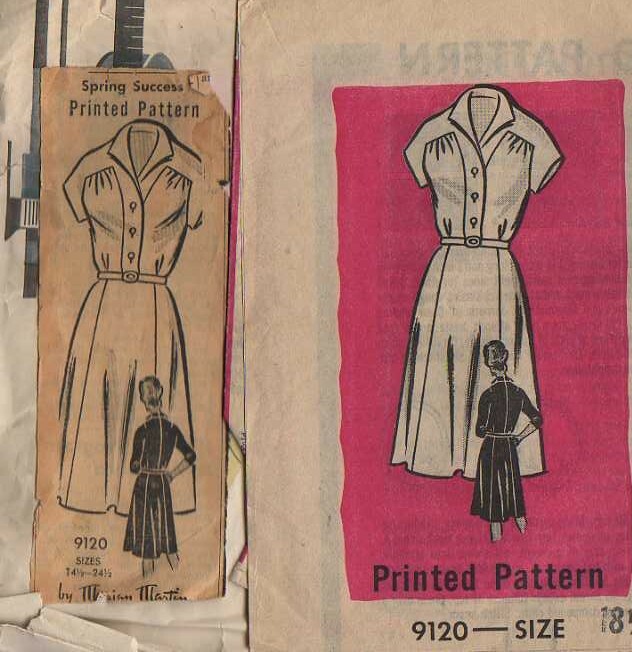 At least I am consoled by the thought that one new sewist is going to have a very happy first dress! Oh, yes. The links are too good, and just keep coming. You all spoil me, you know? First off, I don't know how many of you ARE fans of Simon Winchester, but I know how many of you SHOULD BE fans of Simon Winchester (that would be "all"). He just sent me a link to him talking about his new book on YouTube, and that link would be here. If you ever have a chance to hear him speak in person, grab it (and if you need help figuring out when Simon's coming to your neck of the woods, you can sign up to stalk, I mean track, his readings here). He's tremendously entertaining (and so are his books ). Have I linked to the COPA (Commercial Pattern Archive) yet? It's at the University of Rhode Island. There are some broken links AND their CDs don't work on Macs (!) … but it's still pretty neat. I wish there was a way we could hook them up with the wiki … the wiki right now is about 25% of the size of COPA, which has 25,000 patterns dating to 1868.